Russian-American writer; born at Pinsk, Russia, Oct. 17, 1838; a descendant of the Jaffe family. Educated at home and at the rabbinical seminary of Jitomir, Russia, he became in 1872 chief rabbi of the district of Pinsk, and was called in 1888 to fill a similar position in the district of Nikolaief. At the same time he taught Jewish history and religion to the Jewish pupils at the gymnasium of Nikolaief. In 1891 he emigrated to the United States and settled in the city of New York. 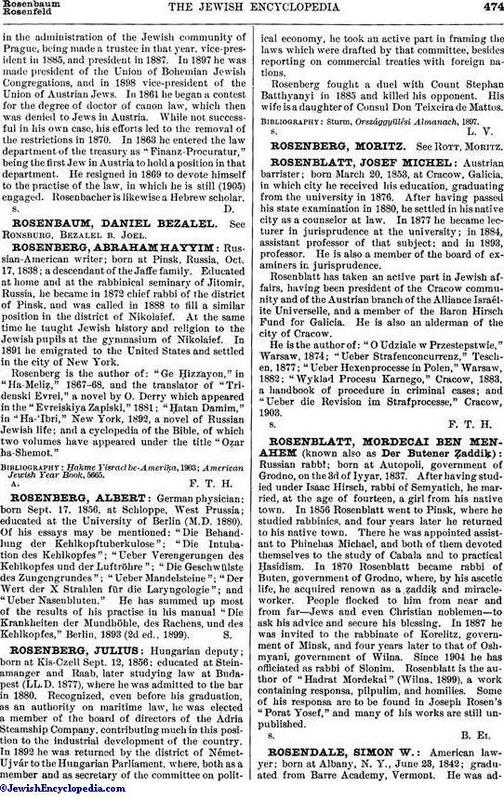 Rosenberg is the author of: "Ge Ḥizzayon," in "Ha-Meliẓ," 1867-68, and the translator of "Tridenski Evrei," a novel by O. Derry which appeared in the "Evreiskiya Zapiski," 1881; "Ḥatan Damim," in "Ha-'Ibri," New York, 1892, a novel of Russian Jewish life; and a cyclopedia of the Bible, of which two volumes have appeared under the title "Oẓar ha-Shemot." American Jewish Year Book, 5665.